Hello! 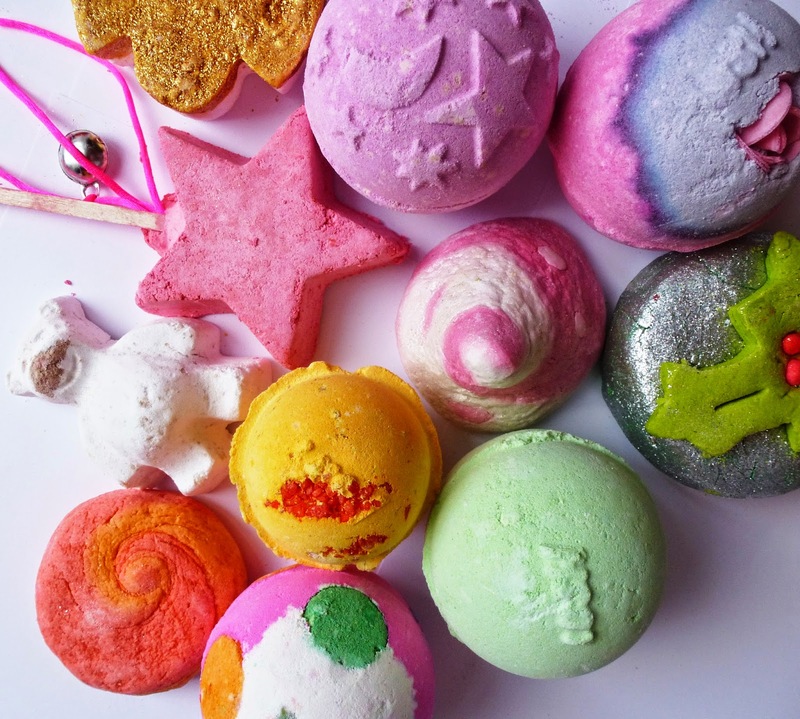 Today I am writing about my recent Lush haul. Those of you that follow me on Instagram or Twitter (@veryberrycosmo) may have seen that I spent a little bit too much in Lush recently. Oops! At University I don’t have baths, so I have purchased myself some goodies for when I get home for Christmas. I am going to cram so many baths into that 2 week period and I AM SO EXCITED! I picked up a few seasonal pieces but also some of the everyday range! 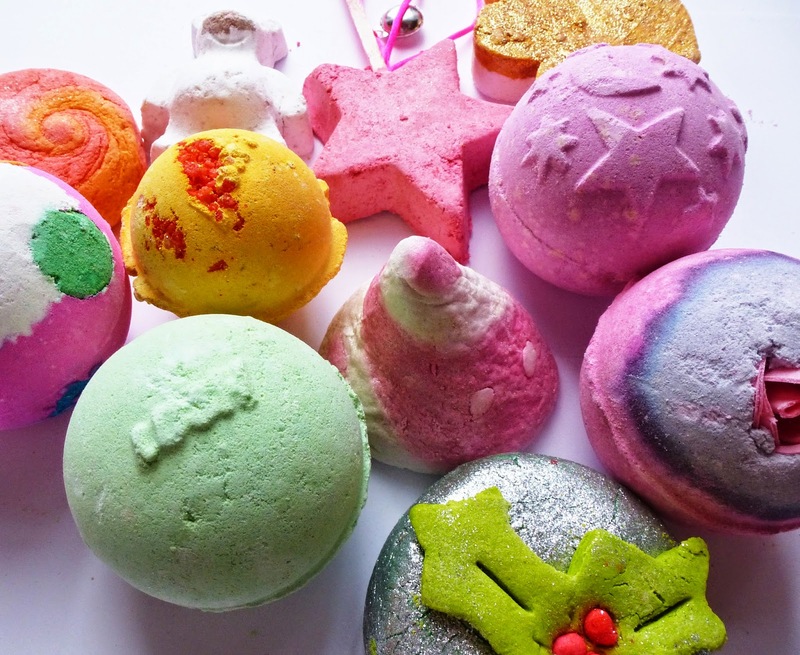 My favourites are the bubble bars, rather than the bombs or melts, because I love LOTS of bubbles! I am shocked that I didn’t buy my all time favourite ‘The Comforter’ but turns out I wanted to try something different since I have only used 2 before of the 11 I have purchased! Maybe you will find something you like the sound of and wish to purchase! I have purchased this one many times because I LOVE it. If you love a citrus fruity fragrance you will love this bar. The Karma scent I find is quite a well established one for Lush, since they have many products including the perfume with this scent. The sweet orange oil in this bar makes you feel so fresh, crumble this up and it will turn your bath a bright orange! A very happy uplifting one! When I first smelt this one I really wasn’t sure, but so many Bloggers and Youtubers (particularly velvetgh0st) have mentioned how much they love this bath bomb, and that it is their favourite one, so I thought I would give it a shot! It contains lavender oil so this would be a beautiful sleepy one and be very calming! This one smells soo nice, cinnamon, almond and orange, I am a lover of cinnamon, so if you don’t like cinnamon this probably isn’t for you, but if you are a fan of cinnamon I don’t see why you wouldn’t like this one! Very autumny and cosy, I just wish it was a bit bigger! I have seen this one on Instagram so much, and the colours look so STUNNING so I am really really excited to use this one. I have heard that the scent itself is similar (or the same) as Twilight, but who could resist the colours of this one?! I picked this one up purely because it is so cute, I mean – look at his little nose! At £1.95 I thought why not! It has a lovely cocoa and vanilla fragrance making it quite creamy and good for the skin. I don’t think this one gets enough credit really! I guess it isn’t the most pleasing to the eye, but it smells gorgeous! Maybe not the one you would walk over to, but I am so glad I did. I think the person I have bought this for will love the scent so so so much. It smells really fresh, it contains avocado and olive oil, which doesn’t sound that appealing…. as well as a couple of oils such as Lemongrass oil – but honestly it does smell lovely! The lady in the shop told me that this adds a green shimmer to the water, as well as being excellent for dry skin sufferers. Give this one a smell next time you are in Lush! Now, I don’t really like this one, but the person I have bought this for, it is their ultimate favourite one. It contains Jasmine and ylang ylang. I think its quite a relaxing, soothing bomb, but I am just not a fan of the scent! I am not sure if I like the scent of this one really, and I don’t usually go for bath melts, but I fancied giving this one a go to get in the festive spirit! I personally don’t usually like being coated in glitter after a bath but I thought this looked really pretty so I thought I would give it a go! Bath melts are very creamy and nourishing, for that added bit of TLC when you need it! *TOP TIP* the lady at the till recommended that you place the angel face down, so that the glitter is facing up in the water for a prettier effect – excited to try this out! I first smelt this and was like ewwwww. But I kept smelling it again, and it just smells so good! Very spicy and festive, I will be using this on Christmas Eve! The lady in the store said that it was like Marmite, you either love it or hate it. Go give this one a sniff!! I am very excited for this one, but once again…. GLITTER. On the talk of glitter, my worst experience of a Lush Bath Bomb EVER was quite a few years a go now, the purple one with silver stars inside. OUCH they were so sharp and pointy and so so horrible and irritant on the skin, so I try steer clear of the ones with loads of bits in, but I guess they stopped doing it…. it was so painful :'( Does anyone remember this one? This one is so cute, and smells oh so girly, and looks it. It has a good price too! It smells like Rock Star my ultimate fave soap when I was growing up, this kind of brings back the memories of when I first became a LUSH LOVER! A very sweet fragrance, if you like snow fairy I am sure you will love this too!! I can’t believe I have never had this one before, really excited to use this one, if it smells like Snow Fairy I AM IN LOVE. Those of you who don’t know what Snow Fairy smells like, firstly, WHAT and secondly, it smells so sweet like candy floss and sugar basically! MMMMM love it. I think the concept of the wand itself is just incredible! 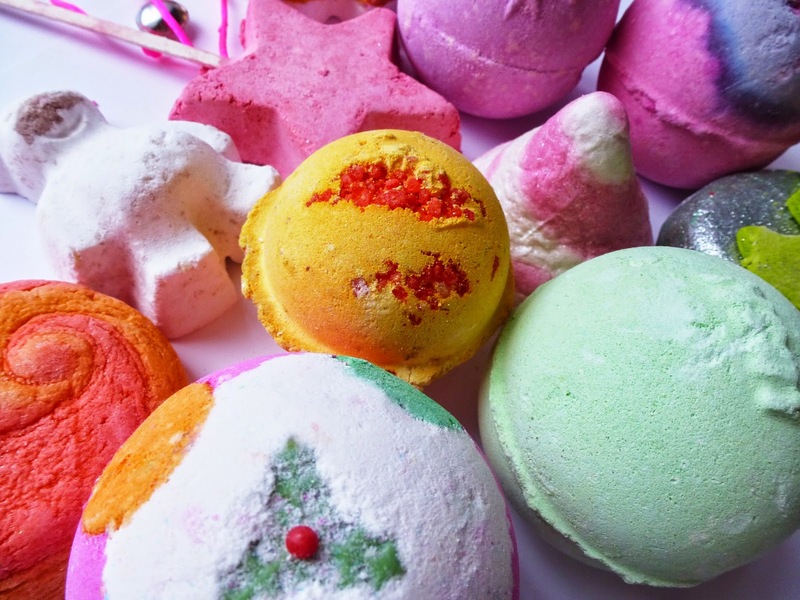 Thank you so much for reading, what Lush products have you picked up recently? Are there any amazing products thats I have missed out on and you would recommend me buying?! I love Cinders so much, it's such an amazing smell. I've grown such a love for Candy Mountain as well this year, this is the 3rd year I've used it and I've only now realised how amazing it smells! Big Blue is also amazing, it's more of a masculine one, but it smells like the sea and has seaweed and sea salt in it so your skin is left so soft! Thanks for your comment sweet! I wasn't going to keep cinders for myself but I'm not sure now!! hahaha 🙂 Candy Mountain does smell gorgeous though <3 I have seen big blue but not had a big fan of the scent, but if it's really good for the skin may have to give it a shot!! I love your pictures in this post. They are so well lit! I long to get pictures like this. Do you use any lighting? Also I love Lush products, I just feel that they are a bit over priced. I loved going to the Lush sale after christmas last year with Blog Beth from http://bethanyworrall.com/ and we got a fair bit for less than half the price. I love candy mountain it reminds me of sweets so much. My mum bought me the wand last year and I wasn't that impressed with it but it smells good. I buy lush things but cut them up so they will last longer, I can't face throwing in a whole bath bomb in the bath, just because they cost so much.